For the latest release of presale Marmalade Sky Rowhomes at Port Royal real estate development in New Westminster, please click on this link. I LOVE New Westminster! Rising from the corner of Begbie and Columbia are nineteen floors of character with a modern twist in the heart of New Westminster real estate community. Just off the riverfront and one block from the New Westminster SkyTrain station, inter urban condosrasle offers new homes ready to move into. Inter Urban New Westminster condos for sale has everything you would expect, plus some things you never dreamed of. Beautiful new homes for sale from $278,000. The presentation centre is now at 14 Begbie Street and is open daily from noon to 5pm (except Friday). With three brand new show homes to showcase the detailed and luxurious finishes here at the New Westminster Inter Urban real estate development, homebuyers still have a great choice of remaining move-in ready suites right now. The combination of historical brick and sheaths of contemporary glass is very striking, and these West Coast inspired homes feature such things as soft grey backsplash tiling and duo tone cabinetry. Both tasteful and contemporary, the New Westminster Inter Urban apartment flats for sale also have large master bedrooms with floor to ceiling glass windows, large living rooms with over height ceilings and an incredible location that is developing into a Yaletown like community very quickly. Antique Alley, Douglas College and the SkyTrain are just minutes away from the new Inter Urban New Westminster apartments for sale, as is Hyack Square and the famous riverfront boardwalk. DREAM BIG. It’s not 10 acres, but 50. Not simply a community – but on of the largest multi-phase residential developments in the Lower Mainland. A series of master planned neighbourhoods with nearly 1000 new homes at Port Royal New West, including single family homes, townhomes, rowhomes, and condominiums and over 14 acres of riverfront parks and walkways. Where? Queensborough, New Westminster. Port Royal. The ideal riverfront community is waiting for you now. It’s no dream. But it’s a big real estate opportunity. Published in the New Home Buyers Guide in November 2007 and here to promote why you should consider Port Royal in New Westminster as your new home. Visit he Port Royal Presentation Centre at Ewen Avenue & Furness Street in Queensborough. They are open noon to 5pm every day except Fridays. 604.520.9890 or www.portroyalhomes.ca. Developed by Aragon. Port Royal Riverside Community is now selling at the riverfront and centre living at Paddler’s Landing at Port Royal. A brilliant 4 storey residential complex with six riverfront townhomes and 44 suites boasting 10 foot ceilings, reclaimed brick feature walls and fir flooring. Condominiums at Paddler’s Landing start from $354,900 and the Port Royal waterfront townhomes start from $549,900. Also now selling is the Red Boat at Port Royal single family homes in a resort style waterfront neighbourhood featuring a unique collection of 94 single family detached homes, duplexes and freehold rowhomes. Single family detached homes at the Port Royal Red Boat development start from $528,900. Own for as little as $1370* per month! Port Royal has arranged a special 3.79% APR rate for the first year of the 5-year mortgage, upon approved credit. Ask about the Zero Payment Deposit Loan, too!. * Refers to Unit #305 in Paddler’s Landing priced at $354,900 at a 75% financing with 25-year amortization at 3.79% APR. Move in this month with river view New Westminster condo suites for sale from just $288,000. New suites now open for viewing as well! Gleaming curtain walls of sheer glass rise above the heritage brick of New Westminster real estate’s turn of the century Inter Urban Train Station here at these new condominiums for sale. Architectural beauty are the two words used to describe the new presale New Westminster Inter Urban condos now selling out with only one hundred and fifty eight residences located along the riverside of the downtown area. With it’s grand re-opening was on December 5th and 6th with finished display suites at 14 Begbie Street and priced from only the mid two hundred thousand dollar range (very affordable for this up and coming area). From Douglas College to the SkyTrain Station and from Queen’s Park to Hyack Square, the Inter Urban New Westminster condos for sale are close to anything and everything you want to be. From fine restaurants to casual diners and from boutique shopping to large department stores, the New Westminster Inter Urban condos are also close to Starlight Casino and major transportation routes. The New Westminster Quay is also within walking distance. From gourmet kitchens to horizontal grain twelve by twenty four inch tile flooring and from stainless steel to duo tone cabinetry, the riverfront New West Inter Urban condos are simply spectacular and great value. Also, spa inspired bathrooms with soaker tubs, large balconies and secure bike storage are other building and suite featuers. This turn of the century looking residential building at Inter Urban New Westminster condos are a gem. Located just steps from the New Westminster Quay, Interurban Condos offers a selection of one and two bedroom homes, many with den, in an eye-catching 19 storey tower that blends heritage brick architecture on the lower floors with the sleekness of contemporary glass above. Anticipated start in the high $200,000s, these Interurban New Westminster homes feature river views, upscale finishings, and a lushly landscaped rooftop terrace for the enjoyment of all residents. The Interurban condos presentation centre and display suite are opening soon at 776 Columbia Street (at Begbie). For more information and to priority register for the New West Interurban condominium residences, call 604.644.7908 or you can visit www.interurbanliving.ca. A selection of one and two bedroom homes at the New West Inter Urban residences homes, many with dens, in an eye catching 19 storey tower that blends heritage brick architecture on the lower floors with the sleekness of contemporary glass above. New Westminster Interurban condo homes feature river views, upscale finishings, and a lush landscaped rooftop terrace deck for the enjoyment of all Inter Urban residents. The New West real estate property perks at Inter Urban condominiums include a great location just steps from the New Westminster Quay. Also, the pricing of the condos start from as low as $275,000. Occupancy for the Inter Urban condos in New Westminster will start previewing now by appointment only with the Display Centre opening to the public mid January. The Inter Urban condos in New West are glass anc concrete rising from the heritage style brick façade of a historical icon of a building. Deposit due is only 5% with a 5% bond. 1 bedroom Inter Urban condos start from $273,000 and two bedrooms from $347,000. A recent article was written by Zac for the New Homebuyers Guide of Vancouver that talked about the great features and location of the new pre-construction Inter Urban condo development in the New West real estate market. According to the article, the New West Inter Urban Condos or Interurban living is about two tales in one city. As Zac explains: To get a feel for the history of New Westminster, one can visit any of the 56 designated heritage sites that tell the story of the first city established in Western Canada. But a stroll down Columbia Street in New Westminster real estate tells anther story, one of a bustling, growing city revitalized by change. Inter Urban Condos reflects these contrasting tales with its unique architectural design according to the New Homebuyers Guide recognized writer, Zac. Located at Columbia and Begbie, the 19 floor residential building at New Westminster Inter Urban will be an elegant blend of sleek, modern design and the classic brick that New West real estate is known for. Further in the article: Something for Everyone at the pre-construction condos at Inter Urban New Westminster real estate. The heritage style brick façade of the lower portion of the pre-sales condominium building will bleond seamlessly with the surroundings. These pre-construction Inter Urban condo suites offer a charming exterior that complements the nearby buildings of the New Westminster real estate along Columbia Streeet. There’s also two landscaped roof tops on the fifth floor, offering great spots to relax and to socialize. The high-rise portion of the New West Inter Urban pre-construction condo development of the concrete residential tower emerges from its brick foundation with striking combination of contemporary curves and floor to ceiling glass. This visual metamorphisis of brick and mortar into concrete and glass is as unique as you’ll find in the area. This novel design of the Inter Urban condos or New West Interurban real estate gives the suites described as river view flats, an amazing view of Mount Baker and Golden Ears, while towering over the Fraser River. Both portions of the preconstruction Inter Urban condominiums will offer the same modern interiors. The finishing brings a luxurious feel, with a choice between either Graphite or Espresso design themes, and is up to the Inter Urban New Westminster home buyer to decide. Granite couners, frameless cabinets, and a large double mount sink highlight the kitchen finishing at the Inter Urban pre-sales New West real estate offerings and the oversized ceramic tiling and a tiled backsplash are other great features. Berber carpets in the bedroom, large, energy efficient windows and vertical blinds are also standard at Interurban New West condo pre-construction. Right next door to Inter Urban is the SkyTrain station as well. The main floor of the pre-construction New Westminster Inter Urban condos wil feature retail shops, which are part of the charming streetscape of Columbia Street. Across Front Street is one of New West’s most recognizable attractions, the Westminster Quay, an eclectic marketplace full of restaurants, shops and fresh goods. Inter Urban New Westminster real estate will have 158 pre-construction condo suites ranging from one and two bedroom and den. The Inter Urban’s presentation centre is located at 776 Columbia Street (beside the Keg) and is open from 1 to 5pm every day except for Fridays. For more information about the preconstruction New Westminster Inter Urban project, please visit www.interurbanliving.ca or call 604.644.7908. Only a 5% deposit is now required to secure your pre-sale New Westminster Inter Urban condominium home today! With nineteen stories of glass and concrete, this New West high-rise condominium tower at the pre-construction Interurban property will have a heritage brick façade and impressive wall to wall and floor to ceiling windows with great waterviews. For residents at the presale Inter Urban New Westminster condo property, you can walk to the skytrain, Westminster Quay, the riverfront board walk and all the shops and dining along this magnificent corridor. Best of all, the New Wesminster pre-sales Inter Urban condo suites start from just $273,000. 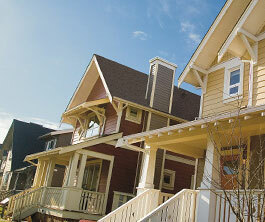 Visit www.InterUrbanLiving.ca today or call Antony Moulder at 604.644.7908 today. Two Tales of One City by Zac G for the HomeBuyers Guide of Vancouver: To get a feel for the history of New Westminster real estate, one can visit any of the 56 designated heritage sites that tell tehstory of the first city established in Western Canada But a stroll down Columbia Street tells another story, one of a bustling, growing city revitalized by change. Inter Urban New Westminster condo apartments reflects these contrasting tales with its unique architectural design of elegan modern classic brick finish in this 19 storey condominium pre-sales tower. It’s All here at Interurban condominiums. There’s over 180,000 square feet of retail space across the street from this residential development and just one block from the skyTrain station. The main floor of the new Inter Urban development in New Westminster real estate will also feature ground floor retail space. The Inter Urban offering right now consists of one to two bedroom unit suites and you can visit the presentation centre today for more information in regards to the remaining units still available. There is something for everyone at New West Inter Urban suites. The heritage brick façade of the lower portion of the residential building at Interurban will blend seamlessly into the architecture of this neighbourhood. These condo unit pre-construction New West condominiums offer a charming exterior that complements the nearby buildings while embrancing the vibrancy of Columbia Street. Theres also two landscaped Inter Urban roof top decks on the fifth floor offering great spots for relaxation and socializing with your neighbours. The high-rise Inter Urban condo portion of the concrete tower emerges from its brick foundation with a striking combination of contemporary curves and floor to ceiling glass. This visual metamorphosis of brick and mortar into concrete and glass is a unique as you’ll find in the New Westminster real estate market. The novel design give the condo presale units at Inter Urban described as river view flats, an amazing view of Mount Baker and Golden Ears, while towering over the Fraser River. Both portions of the residential building in New West real estate Interurban suites will offer the same modern interior finishes. With Graphite and Espresso design schemes and large undermount sinks, stainless steel apppliancces, European style design and much more, the new Inter Urban condo pre-construction properties in New West are units that you should check out before they are sold out soon. With only 5% deposit, you can now own a presale New Westminster Inter Urban condominium homes along the waterfront with prices starting from just $273,000. According to Susan B.: do you hear it? That buzz of excitement? Once BC’s capital, today New Westminster’s downtown core has a distintly 21st Century outlook and a vibrant enthusiasm. This is a city that embraces change yet remains proud of its heritage. And right at the heart of it all is Inter Urban waterfront New Westminster condo tower residences, a stylish presale New West condominium whre tradition meets vision. Nineteen floors, 158 residences, five retail spaces and an architectural style as unique as it is eye catching. Vibrant New Westminster Lifestyle. Inside, it’s clear that these Inter Urban New Westminster homes will be packed with pizzazz to satisfy your urban cravings. The kitchen vignette here at the Inter Urban presentation centre showcases Inter Urban’s granite counters, stainless steel appliances, and sophisticated duo tone cabinetry. Antony assures me, yes, there will also be spa inspired bathrooms with soaker tubs, balconies for enjoying sunsets, and for those more athletically inclined than me, secure bike storage at the presale New Westminster real estate development at the Inter Urban condo project. But it’s when we start comparing notes on the many nearby amenities that I remember why I so enjoyed living in New Westminster real estate – what I didn’t know is how much better they’re about to become. “The City is spending about $1 M to revamp Hyack Square right next door,” Antony says pointing out the window. “And that building right across the street is expected to be converted into a new arts centre very soon.” I’m already impressed but then Antony tells me a final piece of good news about the New Westminster real estate Inter Urban presale condos. “One of Inter Urban’s new retail spots will be a Wicked Café.” Okay, so I’m a latte addict. Bit I know this is one coffee bistro that knows how to do lattes well – the original is only five minutes away from where I lieve and I’m a regular. Looks like I’ll be visiting New Westminster real estate a little more frequently again in the near future. The presale Inter Urban New West condos offers a total of 158 condominium residences ranging from 605 square feet to almost 1100 square feet in a two bed plus den configuration layout. Prices for the presale Inter Urban condos in the New West real estate market start from just $273,900. The Inter Urban presentation centre is open one to five except Fridays at 776 Columbia Street in downtown New Westminster property. For more information, please call 604.644.7908 or you can visit www.interurbanliving.ca. New concrete and brick condominium construction with completion this year at the New Westminster Inter Urban condos for sale are reopening their display suite on May 2nd! Own from just $636 a month based on today’s mortgage rates here at the New West Interurban condominiums. A striking waterfront New Westminster condo development is now nearing completion at the Inter Urban condominium residences that feature a great location from downtown to Hyack Square and from the New West Quay waterfront areas. The Inter Urban New West condo display suite is also re-opening soon and with nineteen floors and only 158 condo residences for sale, these distinct urban New Westminster waterfront condos for sale feature an amazing location with amazing finishes that include granite, stainless steel, and duo tone cabinetry. From deep soakers to horizontal graining and from large format tiles to bike storage, the waterfront New Westminster condos for sale at Inter Urban high-rise residences are also featuring large balconies for outdoor living space. Prices start from the mid $200k range only, which makes it better value than any other waterfront New West condo sale right now. The one bedroom Interurban New West suites start from 605 sq ft to the two bedroom and den units at 1100 square feet in size. Situated just steps away from the best urban hikes, the waterfront boardwalk running west from the New Westminster Quay, Inter Urban condos combines the classic lines and heritage brick of New West’s turn of the century Inter Urban Train Station with gleaming curtain walls of sheer glass. As I catch my first glimpse of the scale model of this pre-construction New Westminster waterfront Inter Urban condominium development, I can’t help thinking the gracefully curved upper structure is shaped just like a cruise ship’s bow. No wonder sales rep Antony says the number one thing people comment on first is the look of the new Inter Urban condominium high-rise tower. “and the views you’ll get fro the upper floors are going to be absolutely spectacular,” he adds. In case I have any doubts, antony quickly shows me just a few of the upper waterfront Inter Urban condominiums thanks to an interactive, point and click computer display. Much as I love boardwalk, I have to admit you sure don’t see the Fraser River this way from ground level. The New West Inter Urban waterfront condos are now selling with only 5% deposit required. Inter Urban New Concrete Condominiums for Sale! New Westminster waterfront real estate market presents the new Inter Urban condos starting from just $273,000. River view living is now more affordable then ever, and with the recent completion of the pre-construction Inter Urban New Westminster waterfront condo towers, the Quay at New West is now bustling with energy and excitement. Inter Urban condos is in the heritage downtown core of New Westminster real estate, making it easy for the 158 resident occupied condominiums to make it to major transportation networks and to enjoy the waterfront lifestyle that this condo tower development provices. From sophisticated interior finishes to long term value, the pre-construction New Westminster Inter Urban condominiums are definitely one of the most sought after areas in the entire Lower Mainland with recent renovations and revamp projects occurring in and around the area. Inter Urban’s gracefully curved upper structer is shaped like a cruise ship’s bow and a fitting tribute to its riverside location. Located at 776 Columbia Street in New West real estate market, the Inter Urban condos are now available under $300k and feature one bedroom 605 sq ft residences all the way to 1100 square foot two bedroom suites for sale. The right place. The right time. Just off the banks of the mighty Fraser River in New West’s Queensborough, Thompson’s Landing offers an intimate collection of heritage inspired three bedroom to four bedroom plus den homes ranging in size from 1,373 to 1,868 square feet. Designed with growing families in mind, this quiet, peaceful neighbourhood represents the perfect mix of comfort and convenience at Thompson’s Landing. Don’t miss your chance to be part of this exceptional community. Thompson’s Landing priced from $472,900. Visit our fully furnished display home this weekend or call us today to schedule a private appointment at 604.520.2226 or visit www.thompsonslanding.ca. 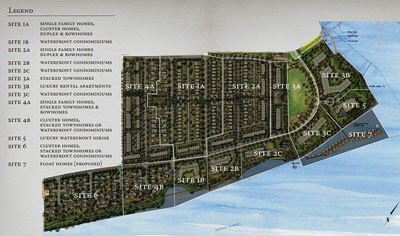 Sales Centre and Display Home for Thompson’s Landing is located at 143 Dockside Court, New Westminster. Open Saturday, Sunday and Monday noon – 5pm or by appointment only. Ask about the double-car garage promotion going on at the New Westminster Thompson’s Landing single family homes real estate development right now. Located next to the Fraser River in New West’s Queensborough, Thompson’s Landing offers an intimate collection of heritage, inspired three bedroom to four bedroom plus den homes. All available homes at Thompson’s Landing New West single family houses range in size from 1,373 to 1,868 square feet and back onto a neighbourhood park. Move in today! Priced from $476,900. NEW fully furnished display home now open at Thompson’s Landing and visit today or call to schedule a private appointment. 604.520.2226 or www.thompsonslanding.ca. Sales Centre and Display Home at Dockside Court in New Westminster BC and open Saturday, Sunday and Monday between 12 to 5pm and Tues and Wed between 3 – 6pm or by private appointment. Barely a stone’s throw from Maple Ridge downtown, Stonegate condos offers the convenience of lock-and-go living in a quiet, natural setting. Bordered by a bridal trail, creek, and rolling meadowland, these Stonegate Condominiums in Maple Ridge residences feature gabled Craftsman architecture with luxurious stone and wood accents, open floor plans, and elegant interior finishing details. Here you’re only six blocks away from the WEstCoast Express, two blocks to the shops and restaurants of downtown Maple Ridge, and an easy three minute walk to the Legion just close to the Stonegate condos. Stonegate condominiums in Maple Ridge are found at 12258-224th Street. For more information about Stonegate residences, and to priority register, call 604.467.5100 or visit www.stonegatelife.com. Be one of the first home buyers to own a great piece of real estate investment in the Maple Ridge corridor, here at the Stonegate condos pre-construction. Distinctive Lifestyle meets Care-Free Living. Urban sophistication in a spectacular setting make Stonegate condominiums a must see. Every condo has 2 bedrooms, plus den, gourmet kitchens with granite countertops, slate backsplash, stainless steel, 9’ ceilings, crown mouldings and more. Enjoy gorgeous views from large patios and be close to the country at Stonegate Maple Ridge condos. Phase 1 of Stonegate is now selling! Priced from $289,900 - $399,900. Visit our beautifully furnished show suite. Open weekends from 12 noon to 5:00pm or private showing are welcome during the week. Call Debra Bell or Richard Chin 604.467.5100. The Maple Ridge Stonegate condos web site is at www.stonegatelife.com. The location is at 12258 224th Street. The Crest, so name because of its location at the top of a hill, is the latest phase at Silver Ridge in Maple Ridge. 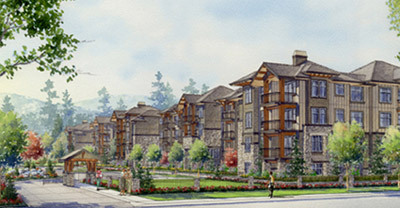 Recipient of a Gold Georgia Award for Best Residential Community in BC, this spectacular, 105-acre master planned community melds seamlessly with its surrounding forested landscape, like an Alpine resort growing organically from the mountainside itself. Parkettes, eco-swales, and rain gardens at the Maple Ridge Crest homes for single families create a vibrant display of textures, colours, and shapes as well as providing natural air freshening and cutting edge, environmentally friendly stormwater management. The Crest Maple Ridge single family homes offers a total of 42 residences priced from $529,900. The presentation centre and display home at The Crest are now open or visit www.portraithomes.ca. The entrance to Silver Ridge is found at 232nd Street and Foreman in Maple Ridge. The Crest single family homes in Silver Ridge are currently under pre-construction phase. Silver Ridge homes are meticulously designed to enhance the natural beauty of the real estate property site’s sloping, forested topography. Your dream home awaits you at The Crest – Portrait Homes’ latest release within one of BC’s most acclaimed residential communities, Silver Ridge. View and Greenbelt homes price from just over five hundred thousand dollars plus GST. A collection of 104 duplex style townhomes, Trails Edge in Maple Ridge is surrounded by natural woodlands and protected green space. These townhomes at Trails Edige meticulous attention to detail gives them a gracious, sophisticated nature and a welcoming ambiance. Door casing are solid wood, baseboards lavishly deep and windows everywhere allow sunshine to fill each room. 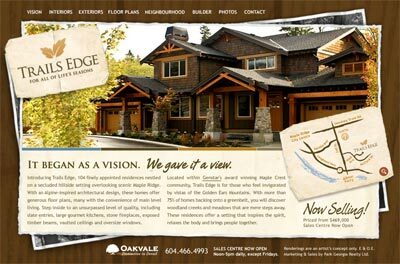 The Trails Edge presentation center and display homes are open noon to 5:00pm daily at 24185 – 106B Avenue in Maple Ridge (take 240th Street north from Lougheed and watch for the signs). A broad range of floor plans from 1619 to 2491 square feet plus unfinished basements are available at the Maple Ridge Trails Edge townhomes today. For more ifnromation, call 604.466.4993 or visit www.discovertrailsedge.com. Introducing Trails Edge, 104 finely appointed residences nestled on a secluded hillside setting overlooking scenic Maple Ridge. With an Alpine-inspired architectural design, these homes at Trails Edge for all of Life’s Seasons offer generous floor plans, many with the convenience of main level living. Step inside and surround yourself with an unsurpassed level of quality, including slate entries, large gourmet kitchens, some fireplaces, exposed timber beams, vaulted ceilings and oversized windows. Trails Edge Maple Ridge townhomes is for those who feel invigorated by vistas of Golden Ears Mountains. With more than 75% of homes backing onto greenbelt, you will discover woodland creeks and meadows that are mere steps away. These residences at Trails Edge offer a seting that inspire the spirit, relaxes the body and brings people together. Sales Centre and Display Homes Open and now selling! DiscoverTrailsEdge.com or 604.446.4993. Trails Edge For All of Life’s Seasons – Finalist Coast to Coast for Innovative Community Design. Trails Edge Maple Ridge, 104 finely appointed residences nestled on a secluded hillside setting overlooking scenic Maple Ridge. These homes offer generous floor plans, many with the convenience of main level living, and a setting that inspires the spirit, relaxes the body and brings people together. The Maple Ridge Trails Edge homes and residences are nominated for best innovative design for communities and recognized by the CHBA National SAM Awards (2007 new home finalist) for best single family attached homes. Priority registration on now for the single attached family homes in Maple Ridge’s Trails Edge and incredible real estate opportunities are available in our next phase of home release. Sales centre and display homes open now at Trails Edge Maple Ridge single family homes and you can get more information online at DiscoverTrailsEdge.com or calling 604.466.4993. Located at 24185 106B Ave, Maple Ridge BC and open Saturday through Thursday between noon and 5pm. Step inside and surround yourself with an unsurpassed level of quality, including slate entries, large gourmet kitchens, stone fireplaces, exposed timber beams, vaulted ceilings and oversized windows at the Maple Ridge Trails Edge development real estate project. Trails Edge Maple Rige is for those who feel invigorated by vistas of the Golden Ears Mountains. With more than 75 per cent of homes at Trails Edge backing onto a greenbelt, you will discover woodland creeks and meadows that are mere steps away. The highlights for this Maple Ridge real estate development at Trails Edge include: 104 finely appointed condominium style residences on a secluded hillside setting. With an Alpine-inspired architectural design, these Trails Edge Homes in Maple Ridge offer generous floor plans, many with the convenience of main level living. More information can be found online at www.discovertrailsedge.com or calling 604.466.4993. For all of life’s seasons, select a new Maple Ridge single family home at Trails Edge today. Opportunities in the Maple Ridge real estate market just don’t last. Desirable Trails Edge in Maple Ridge is about to be even more sought after, with the new Golden Ears and Pitt River Bridges just five months away from completion, making commuting a breeze. With pre-construction Maple Ridge homes for sale pricing ongoing here at Trails Edge starting from just $429,900 plus GST, together with historically low interest rates, there’s never been a better time to move to this award winning community. Here are some great features of the Maple Ridge Trails Edge single family homes for sale community: all homes feature low E windows, energy star appliances as well as low impact landscaping. Whistler inspired architecture surrounded by natural parkland in addition to availability in lavish great room and main floor master suite floor plans. The presales Maple Ridge Trails Edge homes have generous floor plans featuring spacious three bed and den units. Plus, there are 2 new show homes available for viewing at these Trails Edge Maple Ridge homes for sale at 24185 106B Ave. Open Saturday to Thursday from 12 to 4pm. You are invited to visit Highland Forest single family homes and townhomes now open. Be among the first to see this exciting new phase at the Uplands in Maple Ridge. Our new Highland Forest single-family homes are designed to integrate and compliment their natural surroundings. Every home at the Highland Forest real estate development property is on a quiet cul-de-sac next to lush greenbelt interlaced with creeks and fish habitats. These protected green areas are a valuable asset to this ideal location in Maple Ridge. This is a rare real estate opportunity for a few families only, who appreciate the very best in comfort, nature and community. Highland Forest Homes from $634,980 and Uplands Homes from $574,980. Two new Show Homes for the Highland Forest homes in maple Ridge are now open noon to 6pm daily at 24619 Kimola Drive. Phone is 604.466.0505 and website is at www.epichomes.info. Situated on a lushly replanted ravine in Maple Ridge, Copperstone Ridge is an exciting new collection of 29 three and four bedroom townhomes anticipated to start in the $400,000s. These Copperstone Ridge homes in Maple Ridge are designed specifically to reduce the overall environmental footprint and incorporate extensive use of green building technology as well as recycled, renewable materials. Most homes back onto a greenbelt. Copperstone Ridge homes in Maple Ridge will begin selling in the early new year. For more info and to priority register, call Pat Drummond at 604.467.5000 for more details about Maple Ridge townhomes at Copperstone Ridge. Deep discounts are now available at the recently completed Maple Ridge Copperstone Ridge Homes, but hurry, over fifty per cent of the homes are now sold out! As reviewed in the Vancouver Sun, the Copperstone Ridge Homes for sale is a rare opportunity for first time homebuyers to take advantage of savings up to $55,000! Surrounded by nature, these three and four bedroom Maple Ridge townhouses boast private yards, high end finishes, hardwood flooring, stainless steel appliances, slate fireplaces and lots more. No upgrades are needed here and every presale Maple Ridge Copperestone Ridge townhome is a rare opportunity where you can move in today, so there are no pre-sale waits. See the latest in Green Built and Gold Star energy savings Maple Ridge homes for sale today. The price point starts from just $350,900 with on site financing available. Visit the Maple Ridge Copperstone Ridge townhome open house Monday to Thursday from three to six and weekends from one to five. Closed Fridays or call for your personal viewing at any time. The Open House is located at 22206 124th Avenue, Maple Ridge, BC. Speak to Pat at 604.467.5000 or visit www.copperstoneridge.ca today. Phase 1 was sold out on opening day. Phase 2 is now selling and there are still some outstanding investment and primary residence opportunities available so Hurry In! 106 Environmentally responsible homes is the offering form Maple Ridge’s Rio Grande Living condominium suites that range from 1 to 3 bedroom residences and three bedroom townhomes. Features include granite countertops, stainless steel appliances, Kohler fixtures, fireplaces and laminated wood floors. Rio Grande Living in Maple Ridge has their marketing site at www.rioliving.ca and you can register now at the presentation centre and site at 12077 – 228th Street, Maple Ridge, BC. Some of the most affordable real estate condominium offerings in the entire Lower Mainland are at Maple Ridge’s SOLO (which stands for South of Lougheed Highway). A collection of fine starter one, one plus den and two bedroom condo suites at SOLO start from just $139,900. Standard features in all condo homes at SOLO Residences in Maple Ridge include granite, fireplace, designer fixtures, laminate hardwood flooring, stainless steel and much more. You can now register online at www.sololiving.ca or call them at 604.467.0800. The presentation center for SOLO Maple Ridge condos is at 22353 Lougheed HWY and the site address is at 11749-223rd Street in Maple Ridge, BC. Boasting spectacular views of the Golden Ears and the surrounding mountains, Falcon Bluff Maple Ridge is an intimate, family oriented community of 26 single family homes. Priced from $699,900, these Maple Ridge residence homes offer sophisticated, contemporary interior design, including nine foot ceilings, hardwood flooring, and luxurious ensuites. Great rooms at the Falcon Bluff family homes in Maple Ridge feature dramatic floor to ceiling fireplaces as well. Falcon Bluff single family homes in Maple Ridge will officially open their presentation centre in the fall. Until then the showhome is open Saturday through Wednesday (closed Thurs and Fri) from 1 – 4pm at 23875 – 106th Street in Maple Ridge. For more information, please call Lisa at 604.970.2209. As a priority registrant, the West Pender Place Vancouver sales team cordially invites you and a guest to the VIP private unveiling of the spectacular West Pender Place Presentation Centre, well before our official opening in mid-November. This will also be your first purchase opportunity at this prestigious Coal Harbour development, and we will be on hand to assist with your every inquiry. You will be able to choose from a wide selection of downtown Vancouver West Pender Place two-per-floor residences, two-level view lofts, and one and two bedroom city homes. You and your guest can be among the first to experience the refined contemporary interiors in two fully furnished West Pender Place display suites, stunning panoramic views and the bold modernist architecture of this striking addition to the Coal Harbour skyline. Join us for live jazz, hors d'oeuvres and a glass of wine as we celebrate West Pender Place - truly one of the last, and most architecturally spectacular offerings to grace this stunning waterfront neighbourhood. *Requested by acceptance only. Please RSVP before October 28th with your full name(s), phone number and/or e-mail address. Business attire is appreciated. We look forward to seeing you on Thursday, November 1st! In the meantime, please contact us directly if you have any questions. Reliance Properties’ Coal Harbour development includes a highrise tower, a mid-rise and five-level podium building – spectacular high-end residences to meet exceptional standards of exclusivity in downtown Vancouver. Published by Westcoast Homes & Design and posted here to promote the sales launch for Vancouver’s most prestigious and exclusive high-rise tower residences in Coal Harbour. Through the past several decades the face of Coal Harbour has changed dramatically, from a low profile, industrial area to a bold collection of highrises with enchanting mountain and water views. In the midst of this reconfigured landscape some buildings stand taller than others, their landmark architecture a significant legacy. The latest addition to the Coal Harbour neighbourhood – West Pender Place – represents such an achievement through its clean and pure contemporary modernism. Developed by Reliance Properties (Coal Harbour) Ltd., this brilliant architectural composition comprises of three linked buildings: a 36-storey tower to the west, a mid-rise to the east and a central five-level podium building, 144 residences at West Pender Place in all, ranging in size from 600 to 2,300 square feet, penthouses up to 3,700 square feet with equally spectacular roof decks looking out to the marina. The highrise tower at Pender and Nicola at West Pender Place condominiums faces northweast, 90 suites offering spectacular vistas, tow homes per floor from the 25th floor on up, then ingenious designed 1,000 square foot two level urban West Pender Place lofts, with two entrances, one on each floor from the seventh to 24th floor with delightful views to the southeast and southwest. The 10-floor mid rise building at Broughton and Pender at West Pender Place in Coal Harbour downtown Vancouver faces northeast, while the central five-level podium building, with its lush rooftop gardens, assures an oasis of peace and tranquility. All amenities, which are housed in the large tower at West Pender Place living, from the lounge, pool, roof terrace, and full-sized gym to the guest and caretaker’s suite, match any of those found at a five-star resort. Living up to these exceptional standards, interior features, throughout all the West Pender Place condo homes include exclusive Gaggenau appliances in Italian Dada kitchens, hardwood flooring, marble slab and glass walls in bathrooms and full-height glass sliding closet doors and partitions. All West Pender Place Coal Harbour floorplans have been rigorously engineered to enhance space, removing walls and opening up fabulous views. “We want to create a light, transparent, fluid feeling,” Korstanje says. West Pender Place’s stunning presentation centre will open later this month. To pre-register for the Coal Harbour highrise exclusive condo building, visit the website at www.westpenderplace.com or telephone 604.682.6999. The West Pender Place Tower Townhomes are the final release in this Coal Harbour real estate development in downtown Vancouver. With two levels, two bedrooms, 2 and a half bathrooms, plus 2 parking stalls, the Tower Townhomes at West Pender Place in Coal Harbour Vancouver will start from 1100 square feet of harbour living and will be priced from $969,000. The release date for these unique and sought after two bedroom townhomes at West Pender Place is set fro February 2, 2008. You can call for an appointment at 604.682.6999 or visit westpenderplace.com. The Tower Townhome levels at West Pender Place are between 05 – 23.